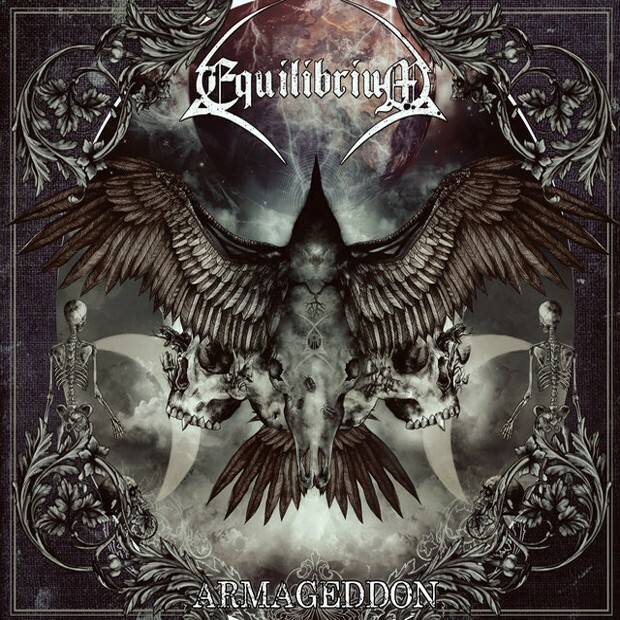 Equilibrium’s fifth album, Armageddon is everything that you want out of them. It’s big and bold. It hit’s really hard and gets you going. You will have to understand, going into this album, that I’m relatively new to their work and have only looked up them quite recently. Coming into this review I was completely blown away by the sheer scale of the album. Every part of the production is massive in delivery and even manages to have its fun jaunty moments. All of the songs are good and the writing really shines, even if I did have to look up some of the lyrics online. The part of this album that I feel lets it down slightly is where is mushes the sounds together to get this muddied sound that’s a little too reliant on the guitars’ distortion. I feel this bogs the sound down somewhat and the guttural vocals aren’t helping. So what you get is this heavy mess of distorted noise. What saves it is the symphonic elements. The big orchestra sound really pulls the album together and gives the songs context. Along with the folk instrumentation, it highlights how fun and exciting Equilibrium are. In fact my favourite parts of the album are just the instrumental parts where there are no vocals. For me personally Equilibrium’s Armageddon is a mixed goody bag. There are odd thing in it that’s just disappointing and I just don’t really like. Then you have the good moments that I find really impressive and interesting. I do feel the good outweighs the bad, as there is a lot of instrumental sections that have that epic quality to them. Overall I do enjoy this album and it definitely made me curious to check out their older material, so I can recommend it as a jumping on point for their music. It’s intricate enough and has a strong enough sound that you’ll want to listen to it a few times. So I’ve found myself in this predicament. Reviewing an album in a language that I don’t speak and trying to discuss a sub-genre that I enjoy but don’t fully understand. This should be a treat. Well before I get started, I will underline this review with this statement: I like this album, I think Grimner are a good band with a lot of potential. There, with that being said. Let’s discuss this album. 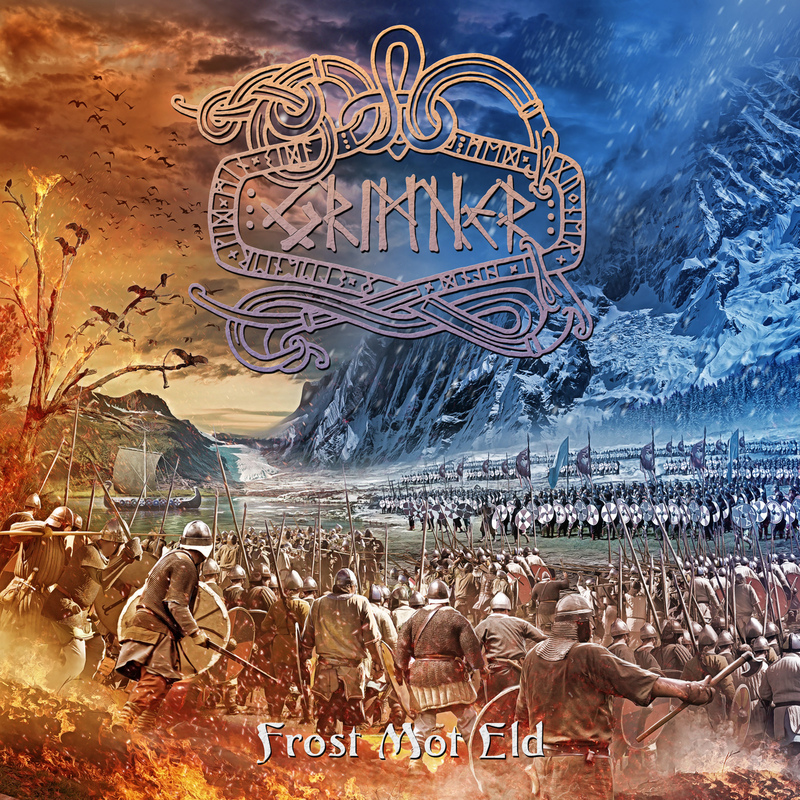 Grimner for the uninitiated are a Viking folk metal band from Motala, Sweden. They have been around for the better part of a decade and their music consists of mixing metal with folk instrumentation. The only real experience I have of this is with the bands Turisas, Korpiklaani and Ensiferum and even that is limited. All of those bands I enjoy just fine but however I think there is a fine line between this music being good and it just not working and all of these band cross that line from time to time. However I think Frost Mot Eld is a perfectly acceptable effort. The production is nice and there is a really nice balance of the metal elements and the folk instruments all the while nothing feels overshadowed everything just hits the right note. The melodies a beautifully written and well arranged. The music encompasses you and while listening to the record I got caught up in the musicianship as I am sure anyone would be. The music is great. The more “metal” elements are catchy and give the album an intensity and harshness which counters the pleasant, clean tones of the folk instrumentation. The only thing that I’m not a fan of is the guttural vocals, don’t get me wrong, they’re not badly executed or anything but when compared to the clean vocals on the album they seem a little lackluster. Even the big choir like vocal stylings shine in comparison. If you’re into that type of vocals with this music then fine. However I feel the clean vocals are just too nice to be pushed to the side for the heavy guttural vocals. Anyway, I’ve been enjoying this album a lot lately and maybe I need to get into it a little more. I like the sound and it’s certainly different to a lot of music I usually listen to. 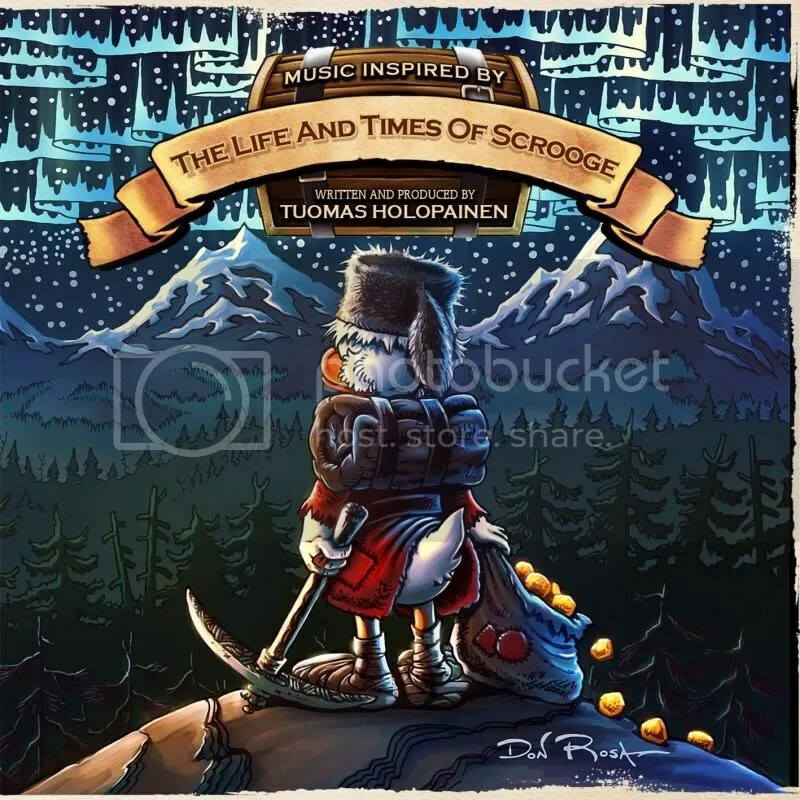 The music is nice and the songs are very well written. I find myself humming the melodies long after I’ve turned it off. If folk metal is your sort of thing and what I’ve described sounds good to you then go check it out. Yorkshire is known amongst many for its rich and diverse music scene, in which many great bands and musicians have appeared and risen to the top. A part of this diverse music scene is the multi-talented solo artist and composer Raeven Irata who has three different musical projects: An electronica project, a classical project and a traditional folk project. The electronica project is different to how many people would perceive it to be. While having the typical beats and synth sounds found in said genre, Raeven Irata adds a twist which features the use of both haunting male vocals and dark yet angelic soprano vocals along with some eerie sounding sections. “Not Destroyed” and “I Sow In Sorrow” are perfect examples of this, though the latter features only the female vocals. “The Zombies Are Coming”, however, has a different sound to “Not Destroyed” and “I Sow In Sorrow”. The track seems to have more of a cyber-industrial feel and sound to it, as opposed to the haunting Gothic effect of the other two tracks, though it is still a brilliant composition. Raeven’s classical compositions are certainly not what a new listener to classical music would expect them to be. Rather than containing the stereotypical “grand and majestic” sound, they are more solemn, sorrowful and melancholy. “The Forbidden Forest” is both a testament to Raeven’s skills and talents as well as a piece of music that many can enjoy. “Waltz Of The Shadow Fae” is a brilliant strings-orientated composition combining an epic feel with a sorrowful sound and atmosphere topped off with a hint of gloom. Whilst the previous two seem sorrowful, “Vaults Of Heaven” is perhaps the more grand-sounding though it still brings that sadness with it, making it a most enjoyable track as it seems to capture real feeling and certainly brings a tear to the eyes. The folk project is an interesting one to listen to. “My Young Love” is composed entirely of Raeven’s strong, powerful and emotional soprano vocals. The only issue with the song is that it’s too short though it does seem to last an eternity, it is a let down when it ends. “She’s Like The Swallow” is another one featuring only Raeven’s vocals. It has a very warm and welcoming sound to it, bringing a small smile to the listener’s face. “All Things Are Quite Silent” is slightly more fast than the previous two tracks, bringing the warm feeling with it. Raeven’s vocals are certainly very impressive when singing “All Things Are Quite Silent”. Raeven Irata is clearly one of the most talented individuals in the Yorkshire music scene at the moment and perhaps one of the most talented in the UK. Each of her projects bring something new to their designated genres, containing emotion and intelligence that one won’t find in the mainstream music of today. Good things are ahead for this talented individual. The official name of Raeven Irata’s music projects is “Crimson Eden”. Since their formation, Cryptic Age have been a rising star in the British underground metal scene, having shared the stage with the likes of Ravenage, Hecate Enthroned, Windrider and Skyclad. “Homeland” is the first chapter in their epic saga. The title track, “Homeland”, is the first track of the EP. It begins with the sound of thunder and rain. Vocals are soon heard over the rain. The Manx Gaelic lyrics are a great touch to the track, giving it a very Celtic feel. With the introduction of the symphonic sections, combined with the drums, bass and guitar the track turns aggressive yet beautiful. The vocals are monumentally powerful, more so than most soprano styled vocals. The symphonic elements bring a very intense, epic sound whilst the guitar, bass and drums bring good ol’ fashioned heaviness. The keyboard solo and the guitar solo that follows can only be described as “sagaic”. ”On The Cold Bare Ground” is the second track of the EP, beginning with a dark and mysterious sounding riff. The riff eventually transforms into a something heavier for a short while before going back to the softer, darker riff. The track does turn heavier again though with an increase in tempo. The vocals ring strongly throughout the track. The drum work is acute and precise. Like the previous track, the solos are mind-blowing. The third track, “Bring Down The Sky” begins very folky, with an acoustic intro and a long symphonic note. The vocals work very well with this intro, conjuring up images of a small Celtic village. The drums add a new dynamic to the track as well. Whilst the first half of this track is slow paced, the second half increases the tempo. The guitar solo is astounding, brutal and masterfully played. The wittily named “No Folkin’ Way” is the second to last track of this so far majestic EP. Like the previous track, it has an acoustic and symphonic intro, though it is short lived before the electric guitar dominates. The symphonic sections are grand sounding, blending well with the guitar riffs, bass and drums. The only downside to this track is the lack of vocals. The last track is “Paragons Of War”. Straight from the beginning, there is a somewhat heroic-sagaic sound resonating from the combination of drums, bass, guitars and keyboards. The vocals complete the track, adding a very majestic touch to it. The guitar and bass sections are brilliantly played and the drums are definitely are a highlight of the track. And the solos are nothing short of grand and noble. Cryptic Age, despite been young, are clearly a talented quartet of musicians. No doubt that “Homeland” is but the first chapter in a long and legendary saga for these Yorkshire lads and lass. Female fronted metal has never sounded so good.